This is most of the projekts i have now. The choopers in the left corner is in 6 mm 5160 and one of them i going to coat and test to put up on youtube. The other one i going to have grinding finish on and handles in tan G10 or green canvas. The survivalmodell on the right side is in CPM154Cm and going to have blasted finish with handles in tan G10. 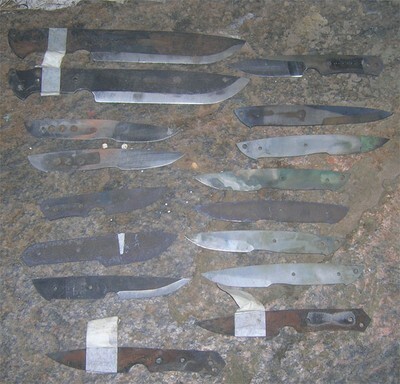 And under that one is one model i call Bushcraft its made of 440C and going to be fullflatgrinded with green canvas micarta. And under the choopers is two Huntersmodells that is heavelly tapered and going to have G10 for handles. Then its survival modells and Budgethunters that i dont have decided how i going to make them. Its made of AEB-L stainlessteel with handle in stained crotched maple. Jesus what i strugled with the sheat i made three before i got satisfied. My latest Budgethunter. Its made of Aeb-L stainlessteel. 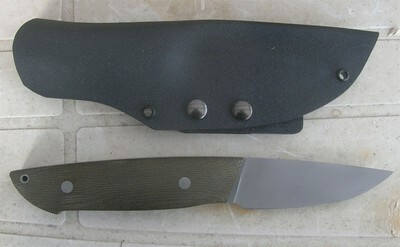 with handle of green micarta. With blasted finish. And a sheat in black kydex.